ictDATA.org: How many online in the US? How many online in the US? The US is one of the few developed nations where a government agency does not carry out an annual survey of Internet usage. The national statistical agency, the Bureau of the Census, does carry out irregular surveys with the last back in September 2001. However, in the rapidly changing Internet world, this is insufficient. On-going monitoring of the Digital Divide, in the country that coined the phrase, is impossible using only official data. There is no shortage of market research companies providing estimates of the number of Americans online. The problem is that few of them agree. A review of data from five different organizations gives the number of Internet users aged 18 and over as between 109 – 151 million for penetration rates ranging from 50.1% to 69.4% of the adult population. This would place the US anywhere from 5th to 16th in world rankings of Internet penetration. Apart from the lack of agreement on the number of users, another shortcoming with the non-official data is that the methodology is not always clear. A further issue is that most of the surveys only capture adult Internet use. Teens tend to be among the most active online and some countries have revised surveys to include this important segment. Indeed, the Bureau of Census surveys include those from age three. The drawback of not including younger users is that the survey base is often divided by the total population when making global comparisons. Thus, the US data would only include adults users divided by the entire population, resulting in a lower penetration rate. A more globally comparable time series for US Internet penetration is needed. The Bureau of Census publishes extracts from Mediamark Research, Inc. Internet surveys in order to provide more up-to-date data (albeit only covering those over 18 years). This data has been adjusted to include estimates of those aged 3-17 years who are online, based on the 2001 Bureau of Census data. 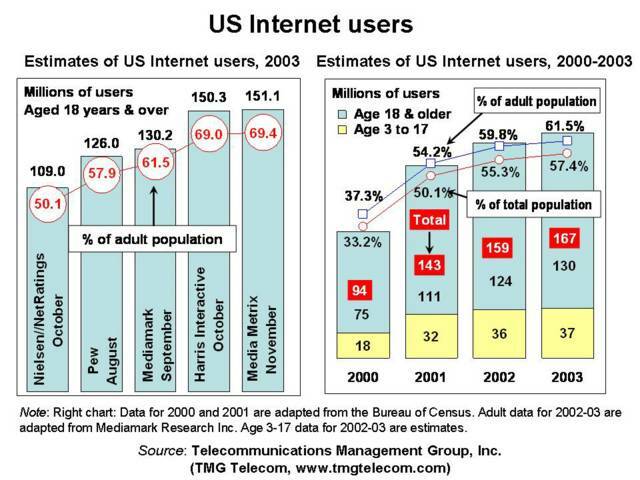 The result is an estimated 167 million Internet users in the US three years and older for 2003 or 57.4% of the total population. One of the striking aspects of the US data is the rapid jump in 2001, a growth rate of 16.9% over the previous year. 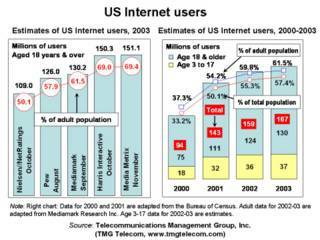 Since then, growth has declined dramatically with the number of Internet users in the US only rising 1.7% in 2003.